"When are you going to sweep the trail?" We regularly get this question about almost every trail and heavily-used highway shoulder in the state. The people traveling through those areas may not know who manages that stretch of trail or highway or who to reach out to. They just want to roll or stroll along a freshly cleaned surface. Around the state, our maintenance crews prepare for extra bike travel and more people getting outside, whether it's sweeping to get ready for National Bike Month in May or working with organizers of major rides to clean shoulders in advance of a scheduled event. Like housework, maintenance is never done – no sooner do you clean one place than another one gets dirty. You tackle that and then the first spot you cleaned is dirty. Again. If you want to let us know about a state highway shoulder or trail that is need of maintenance, here's how to contact us. We'll try to work it into our schedule as time and other priorities allow. A sweeper truck works on the Children of the Sun Trail near SR 395 in Spokane. Here's some of the places you might see crews out in April or May sweeping, cutting back brush to improve sight lines, or perhaps applying sealants to address cracks. Why not give them a wave and a thank you when you see them? Some sweeping already took place and some is scheduled ahead of the Inland Empire Century Ride on May 12. Crews also make a special effort to apply weed controls to address the infamous puncture vine that creates many a bike tire puncture and cry of, "Oh, no, I have a flat!" Look for sweeping along State Route 24 and SR 823. Children of the Sun Trail was swept the first week of April. Crews swept US 101 from Quilcene to Queets in March, Tacoma's Scott Pierson Trail the second week of April, followed by the Interstate 5 Olympia trail. 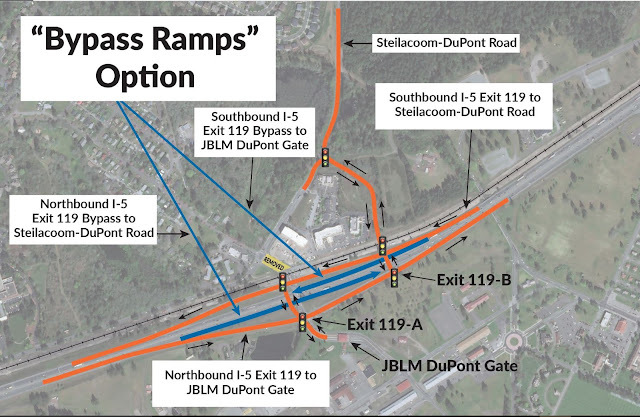 Next up, they'll be hitting all the paved shoulders on SRs 305, 104, 307, 3, and the Hood Canal Bridge. 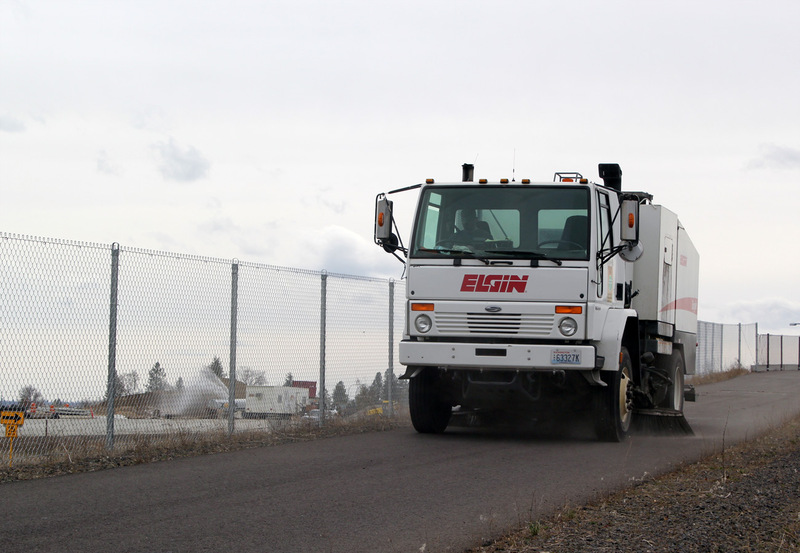 Crews will be sweeping the SR 520 Trail, I-90 and the path along SR 99 by the 1st Avenue South bridge. They'll also be making pavement repairs. 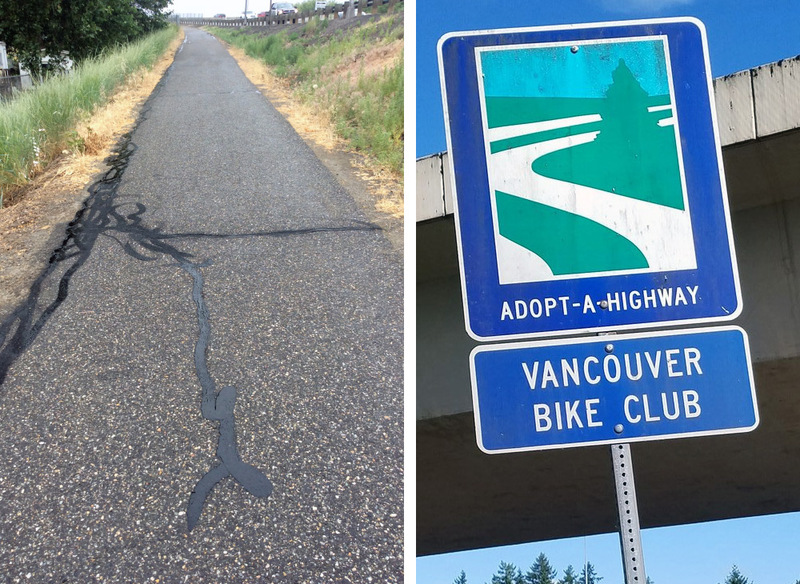 Left: Our crews work to seal cracks on bike/pedestrian trails as quickly as possible, like these in the Tri-Cities. Right: The public is key in helping us keep trails clean and safe for all users. If you're the one in charge of household chores for your family, you know it's easier to keep up with the cleaning if everyone pitches in (and if they don't contribute to the mess in the first place). We can all be part of the solution on our trails and highway shoulders. Please be sure to always secure your loads – even on a short trip – to keep trash or debris from littering roadways and trails. Likewise, please properly dispose of any trash. Even "small" items add up when you multiply them by all of a trail's or roadway's users. And please share this message with friends and neighbors. We need everyone working to keep our state beautiful. You also can volunteer to pick up litter on your favorite trails (or just do it as you walk through). In Clark County, for example, the Vancouver Bicycle Club cleans a section along SR 14 as part of our Adopt-a-Highway program, which also includes trail cleaning and other volunteer opportunities. Near Cle Elum, volunteers pick up litter along Progress Path, a paved trail linking West Cle Elum to Cle Elum/Roslyn Schools. The trail, adjacent to SR 903, was funded in part with our Safe Routes to School funds. If you're involved with a group interested in volunteering to maintain a section of trail, contact one of our Adopt a Highway coordinators. Happy trails! Due to colder temperatures and forecasted rain, all remaining weekend closures of westbound US 2 are postponed until spring 2019. 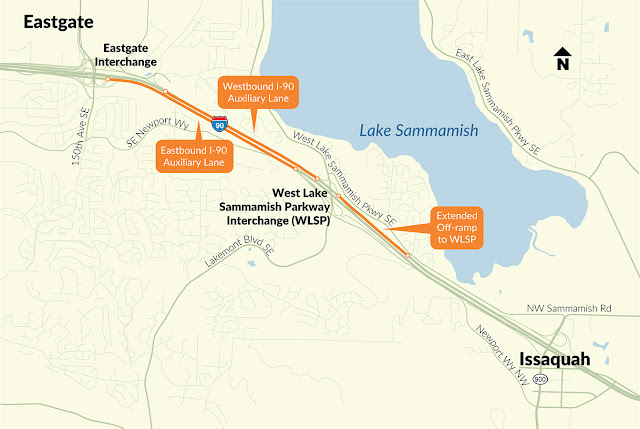 The three miles of US 2 between the I-5 interchange in Everett and Bickford Avenue in Lake Stevens are getting a critical makeover and travelers should prepare for six weekends of westbound lane closures. If you've driven this area recently, your tires have told you about the dire state of the asphalt on this stretch of US 2. It's riddled with potholes, gaping cracks and ruts and it needs some help. 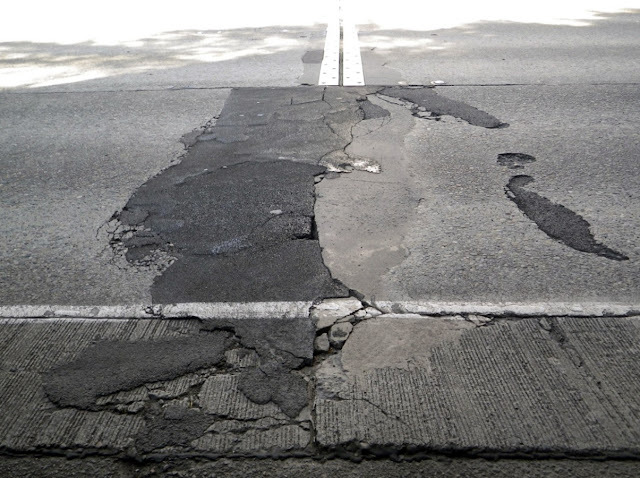 Westbound US 2 between Everett and Lake Stevens needs some significant repairs and they're happening this spring. So starting this spring, our contractor crews will remove the old pavement on the westbound lanes, including the Hewitt Avenue trestle. The pavement is 16 years old, outliving the projected lifespan of 12-to-15 years. 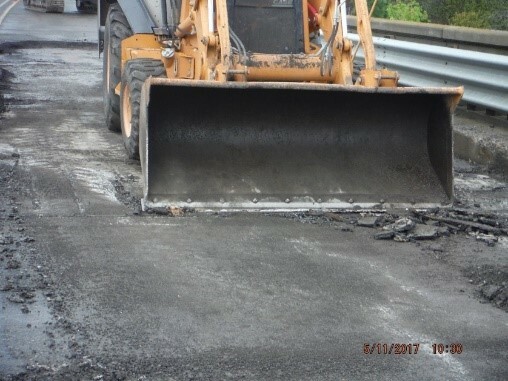 Once the battered asphalt is removed, the trestle will be inspected. Any needed repairs will be made to the structure before a new waterproof coating is applied to prevent our harsh PNW weather from corroding the rebar and from water moving down into the concrete bridge deck. Only after all that can the new layer of buttery smooth asphalt be applied. Crews will also improve almost two miles of the eastbound lanes from the US 2/SR 204 interchange to Bickford. Because the eastbound trestle is made of newer concrete, there's no repaving happening there so no full weekend closures eastbound are needed. This work is weather-dependent and closures may be rescheduled if it rains. The need for six weekend closures comes down to size and time constraints. First up, size. The trestle is too narrow to accommodate construction work, machinery and keep a lane open while still keeping the crews safe from traffic rushing by. Due to the width of the trestle, and to avoid any unnecessary wear and tear on the bridge, crews will use an asphalt removal method called "hand grinding." I pictured people on their hands and knees sanding down the roadway, but that can't be further from the truth. Instead, they'll use a smaller loader to pop up and scrape off the old asphalt. 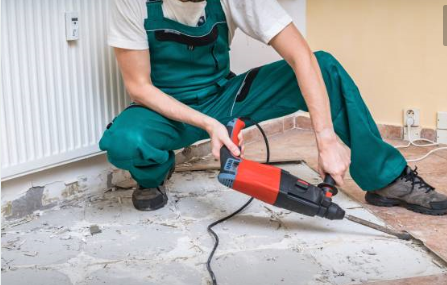 Think of it like removing tiles from the floor of a kitchen or bathroom, but with giant equipment and not hand tools. No, hand grinding doesn't involve us using hand tools. Instead, a small loader pops up and scraped off old asphalt. Now to that pesky thing called time. All the preparation work and repairs our crews have to make before pouring new asphalt takes far longer than the seven hours we get in a typical overnight closure. Roughly 2,600 drivers use westbound US 2 every hour on the weekends. State Route 9 and 20th Street Southeast are the primary detours for our weekend closures. Both routes are single-lane and can't absorb all these displaced drivers without creating lengthy backups. Adjust westbound travel to be during non-peak hours (before 8 a.m. or after 9 p.m.). Plan to stay overnight at your destination so you're traveling during non-peak hours. Overnight work in the westbound lanes of US 2 is scheduled to end by 5 a.m. on weekdays. Overnight work in the westbound lanes of US 2 is scheduled to end by 8 a.m. on weekends. Overnight work in the eastbound lanes of US 2 is scheduled to end by 7 a.m. on weekdays. Overnight work in the eastbound lanes of US 2 is scheduled to end by 9 a.m. on weekends. We appreciate you taking the time to plan ahead, know alternate routes and being an engaged community member. You're taking the right steps to prevent being stuck in traffic, and you're minimizing congestion for your neighbors as well. Andre Rayford drives in Renton near the Interstate 405 and State Route 167 interchange every day. Having lived in the greater Seattle area his whole life, he knows the area well and has noticed the changes over the years. 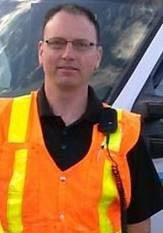 One detail that sets him apart from other drivers on I-405 and SR 167 is that he works at night as a traffic control supervisor/labor foreman for the I-405/SR 167 Interchange Direct Connector Project in Renton. He has a keener eye for the construction and changes in the area because he helps make them happen. Rayford has been working as a traffic control supervisor on the Direct Connector Project for about a year and in traffic control since 2007, when "Umbrella" by Rihanna first hit the airwaves and the Seattle Supersonics were still dribbling basketballs at KeyArena. Through more than a decade on construction projects around the region, he has seen his fair share of work zone incidents. Andre Rayford has been involved in a few work zone incidents in his time working on our I-405 construction projects. "Depending on where you're at, some of the incidents are expected," he said, giving the example of drivers having difficulty merging while crews are setting up lanes for closures. "You don't want it to happen, but you should be prepared for it." 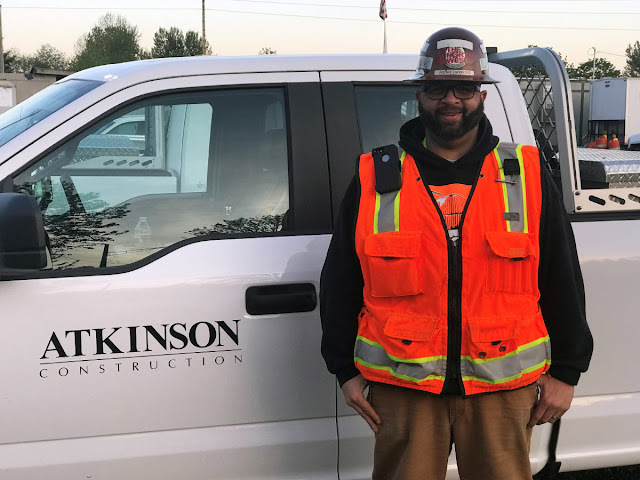 It wasn't until Rayford started working on these projects that he truly became more aware of work zone safety, including the importance of paying attention to signs on the roadway. The first incident he experienced happened several years ago, when he was working on the first SR 167 HOT lanes extension project. Rayford's crew was setting up closure signs on northbound SR 167, as well as using a truck-mounted attenuator. An attenuator is a safety precautionary vehicle intended to absorb the impact of a collision, minimize damage made to the vehicle and save crew workers' lives. After setting down the device, the crew and Rayford moved their trucks to the shoulder. "I had just put the truck in park and then there was this plume of smoke and fluids everywhere," he said. A driver, who reported after the incident that he had not noticed traffic slowing down, hit Rayford's pickup truck, which then moved forward about two and a half feet, clipping the truck that the rest of his crew had been in. Fortunately, Rayford and his crew had exited their vehicles just in time. "If I had gotten out of the truck a couple seconds earlier, it would have been a potentially fatal incident with serious injuries," he recalled. "That was my first serious incident on the job and it was a real wake up call." For Rayford and countless others like him who work on our construction projects, the importance of safety is personal. Andre Rayford, who works on our Direct Connector project, likes spending time with his wife and two sons. "I grew up in the area right up the hill, and I live less than five minutes away from the project today. I do the drive everyday and I can see the progress being made," Rayford said as he described what working on the Direct Connector project means to him. "I'm proud of it." 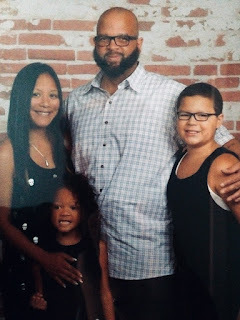 When he isn't working, Rayford enjoys spending time outdoors with his wife, Alissa Ouano, and two sons, Joelani, 6, and Jakobi, 12, especially during the summer, when they frequent the Henry Moses Aquatic Center in Renton. So, the next time you're driving through a work zone, remember Andre and the other members of the construction crews, and give 'em a brake. "Be aware of the signs. Read the signs. On any project," Rayford emphasizes to people driving through work zones. Slow Down - Drive the posted speeds, they're there for your safety. Be Kind - Our workers are helping to keep you safe and improve the roadways. Stay Calm - Expect delays, leave early or take an alternate route if possible; no meeting or appointment is worth risking someone's life. 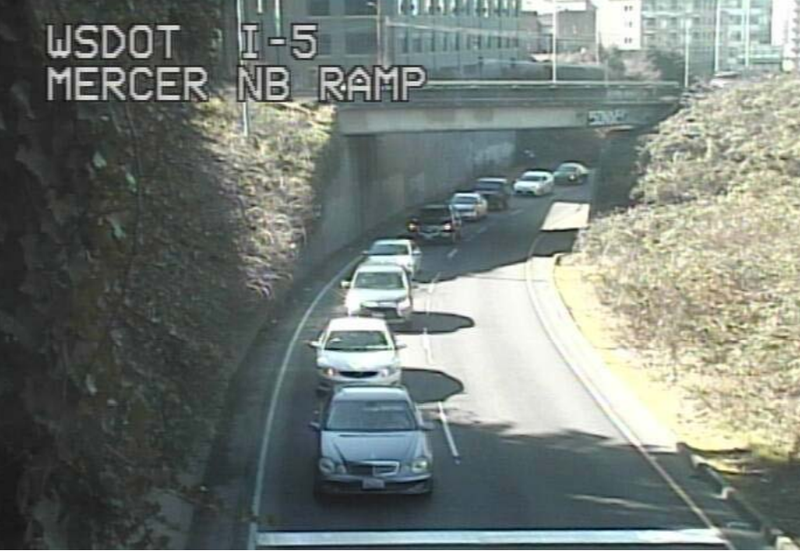 If you’ve ever driven on I-90 during rush hour, you know that cars often move at a slow crawl. 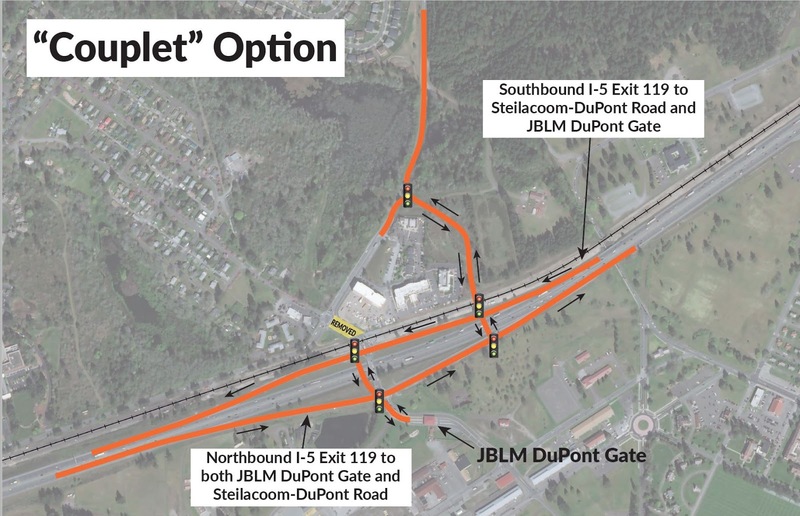 We have been working hard to create a solution to the increasing traffic between Eastgate and Issaquah, and we have a plan. We will present the details of our solution at our open house on April 25 in Issaquah. We looked at a variety of solutions to solving this traffic puzzle, and, we have determined that an additional lane in each direction will best meet the needs of drivers. Our plan is to build an auxiliary lane in each direction between the Eastgate and West Lake Sammamish Parkway interchanges. An auxiliary lane is a lane that begins at one interchange and ends at the next interchange. Our project team will be available to discuss the project in depth at the open house and you will have an opportunity to provide input on aesthetic designs for noise walls as well. This project was funded as part of the Connecting Washington funding package in 2015. Construction is expected to begin in mid-2019 with the lanes open to traffic in early 2020. The open house will take place from 5-7 p.m. on Wednesday, April 25 at Tibbetts Creek Manor in Issaquah. There is no formal presentation. Attendees are welcome to drop by anytime. 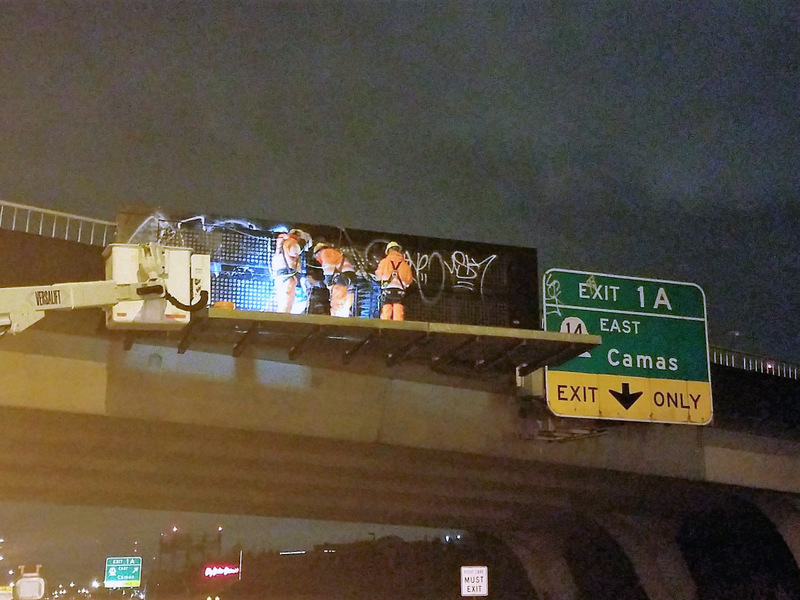 Maintenance technicians Eustacio Valencia and Clay Scoggins were spending their Sunday workday, April 15, removing graffiti from several signs along northbound I-5 in Vancouver. This is no easy task, as it requires our crews to be working near traffic and sometimes they have to get into some difficult places to reach. Unfortunately, their job was made even more difficult and dangerous on that day. Clay Scoggins (left) and Eustacio Valencia were doing a graffiti cleanup job on I-5 in Vancouver when a semi entered their work zone and collided with a work truck. Fortunately neither were injured. 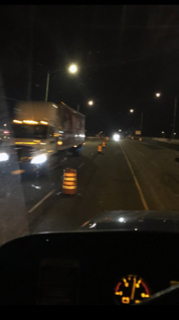 After setting up two message boards warning of the work happening up ahead, Eustacio and Clay closed the two right lanes of the highway to set up a work zone. We also had a TMA (truck mounted attenuator) in place to protect the crew, but while Eustacio was in the vehicle, a semi entered the work zone and sideswiped the truck, knocking off the side mirror. The semi did not stop. Fortunately, neither of our workers were injured. The State Patrol is still trying to identify the semi. the work zone and sideswiped it, knocking off a side mirror. Whether it's cleaning graffiti, repairing potholes or helping stranded drivers, our road crews put themselves on the line every day to try to keep our highways safe. It is dangerous work, and they can all recount near misses. And those are the lucky ones. Many others are injured on the job, and since 1950, we've had 60 workers killed while working. It's also easy to forget that all of those workers have family and friends who want them to get home safely. We often simply see signs, trucks, vests and hard hats but fail to remember that those are real people doing work in often high-stress situations. Graffiti cleanup can sometimes put our crews in challenging spots and situations. But everyone can help keep them safe. Always focus near work zones. Slow down, move over and give them space. No one likes being stuck in traffic because of roadwork, but stay calm and work together to keep everyone safe. And, be kind. The workers are trying to do important work to benefit everyone. Help them help you. We're glad that Eustacio and Clay weren't hurt, but we hate hearing about any of these close calls. So let's all do our part to send all of our road workers home safely. As DJ Jazzy Jeff and the Fresh Prince told us way back in 1991, summertime is a great time to sit back and unwind (did I just date myself?). Unless, of course, you are one of our construction crews. 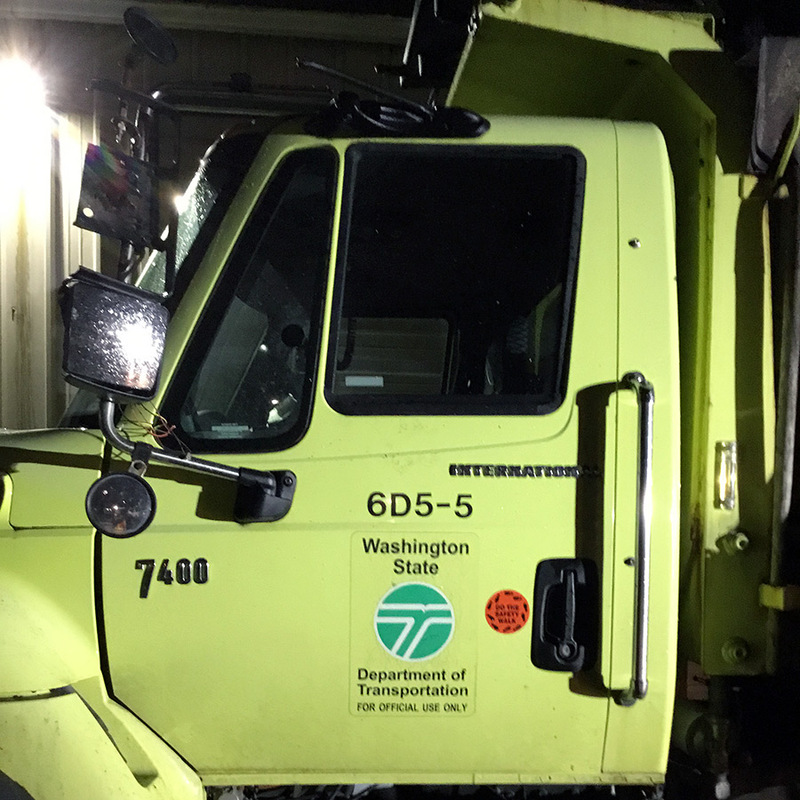 When the hot and dry weather gets here and most of us are enjoying evening fireworks and disappearing plates of watermelon, crews will be gearing up for a busy season. While sparklers and bonfires won't be allowed at these events, warmer weather is required as contractor crews begin two construction projects between Aberdeen and Montesano, including a seven-mile overnight paving job on US 12 from Sargent Boulevard to the Wynoochee River Bridge in Aberdeen followed by a fish barrier correction project west of Montesano. As early as May, crews will begin an asphalt paving project to renew a portion of US 12 from Aberdeen through Central Park, with most of the work taking place overnight to reduce traffic impacts. 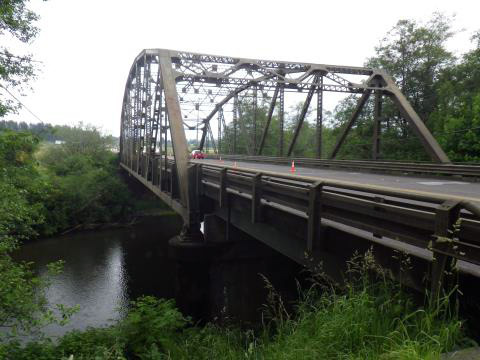 They will also make repairs to the driving surface of the Wynochee River Bridge. Work on the bridge will require nighttime, one-way alternating traffic. 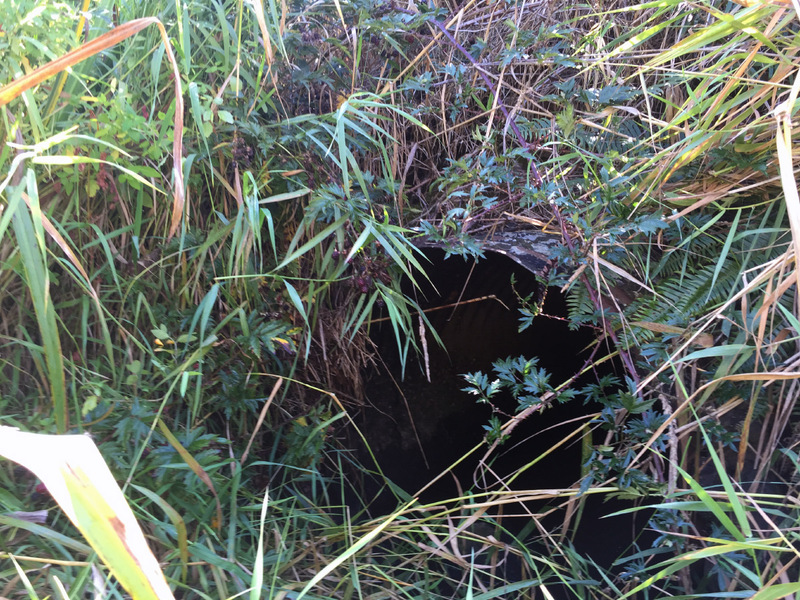 Shortly after the Fourth of July holiday, we will begin removing and replacing a small culvert that runs under US 12 just west of Montesano. This project will reduce US 12 to one lane in each direction around-the-clock through early fall. Drivers can expect reduced speeds of 25 mph through the work zone. We are required to improve creeks and streams in the region by rebuilding fish barriers in addition to restoring and relocating the creeks and streams so the fish in those waterways can swim more freely. US 12 is the major east-west highway in Grays Harbor County. This section serves about 20,000 vehicles per day. In addition to local commuters, freight and transit, tourists visiting our beaches during the summer cause traffic volumes to soar. Unfortunately, summer is also the primary time we can get most of our paving work done. Much of this work needs dry, warmer weather for asphalt to set and harden and lane striping to adhere to the pavement. There really is no "good" time to close lanes and do this kind of work. 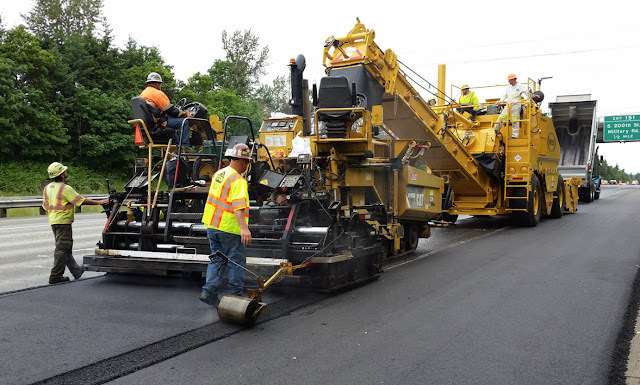 State highways are an important link for our economy and our crews will work to keep traffic moving as well as possible through the back-to-back construction projects by doing a majority of the paving work at night. Advanced notification of construction-related closures is posted on the Olympic Region Weekly Construction and Traffic Updates web page. Travelers are encouraged to sign up for Grays Harbor County community alerts. We know this is going to be a challenge for travelers in the area and we appreciate your patience as we get this important work done. Amy Laveway has had one too many close calls on the roadway and recalls veering off to avoid being hit by objects thrown from vehicles, motorists themselves, or worse. "I have been lucky," she said. But not everyone in her line of work can say the same. Laveway is a 13-year truck driver foreman with Lakeside Industries, one of our local asphalt contractors. Construction runs in her family, as her dad and grandfather were both in the business. Newly married, the thought of never coming home to her loved ones after a shift on the highway is a real nightmare. Amy Laveway says she has "been lucky" to not lose her life working in a construction zone by distracted drivers. While a vehicle in a construction zone has not hit her, Laveway says several of her coworkers have suffered serious injuries. A fellow foreman at Lakeside Industries was injured in a work zone by a distracted driver and lost his leg. The employee is still unable to return to work. "If I was hurt it would create a huge financial hardship for my family," she said. In the past 10 years, the number of distracted or inattentive driver citations in work zones in our state has increased by 66 percent. Last year alone, that number reached 659. Like Laveway's coworker, many have lasting injuries that change their lives forever. Vehicles speeding by Amy Laveway's truck during a construction operation. Far too many of our workers and contractor crews have had narrow escapes with death by motorists flying by or encroaching too close to the boundary. 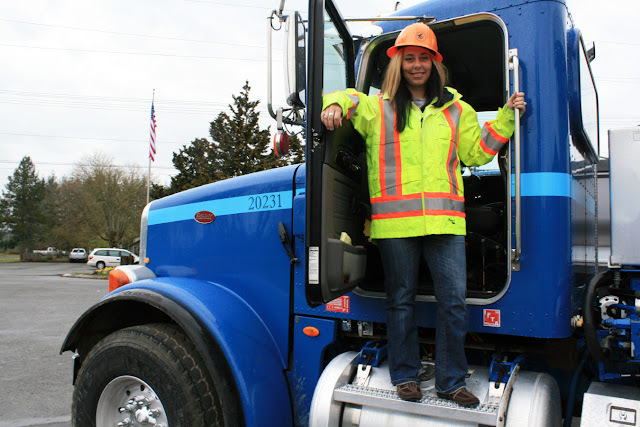 Since 1950, we have had 60 workers – husbands, children, coworkers, and mothers – killed in work zone-related incidents. They leave behind real families with real wounds that will never be the same. We treat safety as our top priority, whether it's our own employees or contractor crews working for us. Rob McNelly, Lakeside Industries Superintendent, said a speeding driver killed his cousin in a work zone near Mayfield Lake in Lewis County in 2000. "It was like yesterday," McNelly said. "He left behind four kids that I go visit regularly because they lost their dad." Laveway has had garbage and bottles thrown at her while working, along with bearing the brunt of hand gestures and colorful language. We work hard to keep our workers safe with equipment and training but need the traveling public's help. Slow Down – Drive the posted speeds, they're there for your safety. Be Kind – Our workers are helping to keep you safe and improve the roadways. Stay Calm – Expect delays, leave early or take an alternate route if possible; no meeting or appointment is worth risking someone's life. The next time you are driving, keep in mind workers like Laveway who work hard to keep drivers safe and improve our roadways. Decades of patchwork fixes, Band-Aid repairs and emergency maintenance can't be ignored any longer. Interstate 5 through the heart of Seattle needs major work done. Badly. Much has changed since the roadway opened in the 1960's. Back then, the new surface was smooth as butter. If you drive the interstate today, you know that is no longer the case. Yes, we do regular inspections and preventative maintenance all along I-5, but a full-blown rehabilitation has never happened… until now. it hasn't had a major facelift since it was built in the 1960s. This spring and summer, northbound I-5 from MLK Way (State Route 900) to Northeast Ravenna is getting 13 miles of new concrete and asphalt and 37 new expansion joints as part of a $51.2 million facelift. 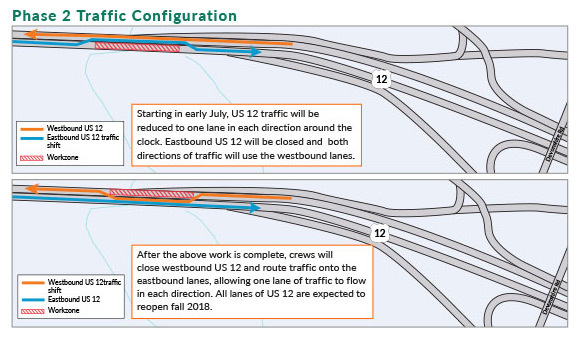 It's a tremendous undertaking that will require at least six weekends of lane reductions on northbound I-5 near Spokane Street. Two of the six weekends will require full closures of northbound I-5. With so many events in Seattle over the spring and summer months, there is never a good time to close lanes on I-5. We've been working closely with the SoDo stadiums, event managers and downtown associations to pinpoint the weekends with the fewest conflicts in an incredibly vibrant city. Over the six weekends of work, crews will start the closures late Friday night and wrap up by the Monday morning commute. As part of our #ReviveI5 work in Seattle, we'll be replacing 37 expansion joints. Much of this work can only be done during dry weather so the schedule can change. If that happens, we will send out email alerts regarding changes to the above itinerary. You can also bookmark the King County Construction page to easily reference all closures. Use state routes 99, 509, 518 and I-405 instead. Travel before 8 a.m. or after 8 p.m.
Move any discretionary travel to another weekend. Plan on spending the night in Seattle to avoid traveling during the closure. 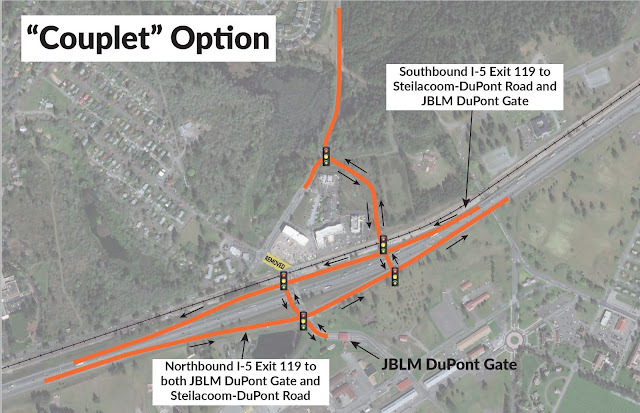 Major work to rehab I-5 began last year on the southbound highway between Tukwila and Kent. 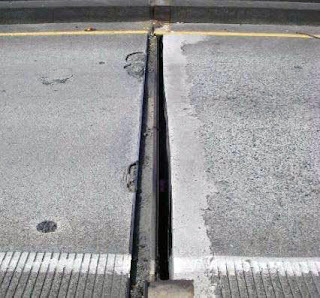 Every year, we get money from the legislature to do preservation work on the worst sections of I-5. It is more cost effective for taxpayers to protect the roads we already have versus building new ones. 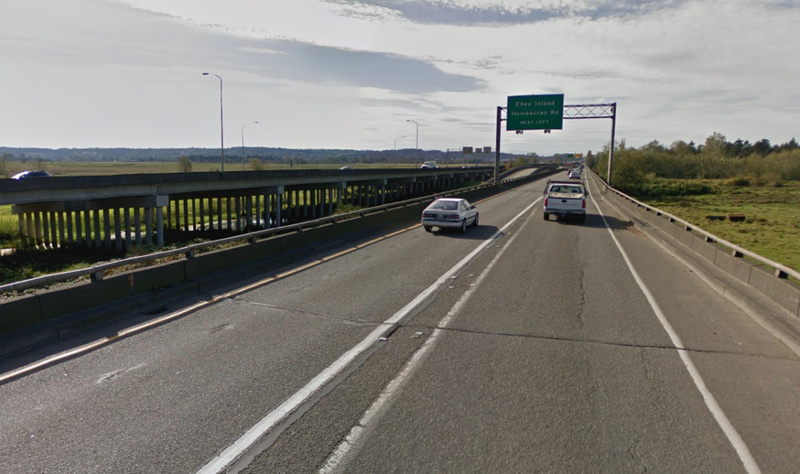 Last year we started a $27 million rehabilitation of roughly 13 miles of southbound I-5 between the Duwamish River Bridge in Tukwila and South 320th Street in Federal Way. That project, and this year's work on northbound I-5, is all part of the years-long #ReviveI5 preservation project ensuring safe and reliable trips along 38-miles of Washington's busiest highway for decades to come. We know this construction will create a rough commute through downtown, but this historic preservation project will reduce the need for future emergency repairs that add time to already long commutes. We thank you in advance for the adjustments you'll make to your plans during this project as we work to restore a smoother, safer ride on I-5 for generations to come. People on bikes are bicyclists, people on the sidewalk are pedestrians, right? But wait — what am I if I get off my bike and walk around the corner? A mode of transportation isn't permanently affixed to my forehead or coded in my DNA. A bicyclist who puts a bike on the rack and gets into an SUV becomes a motorist. A driver who gets out of a car instantly becomes a pedestrian. A pedestrian who gets on a bus becomes a transit rider. Underneath the labels, they're all people just trying to get somewhere. That's really the point of our work for an integrated, multimodal transportation system: Make it possible for people to get where they're going and make sure they have the freedom to use the modes that work for them. 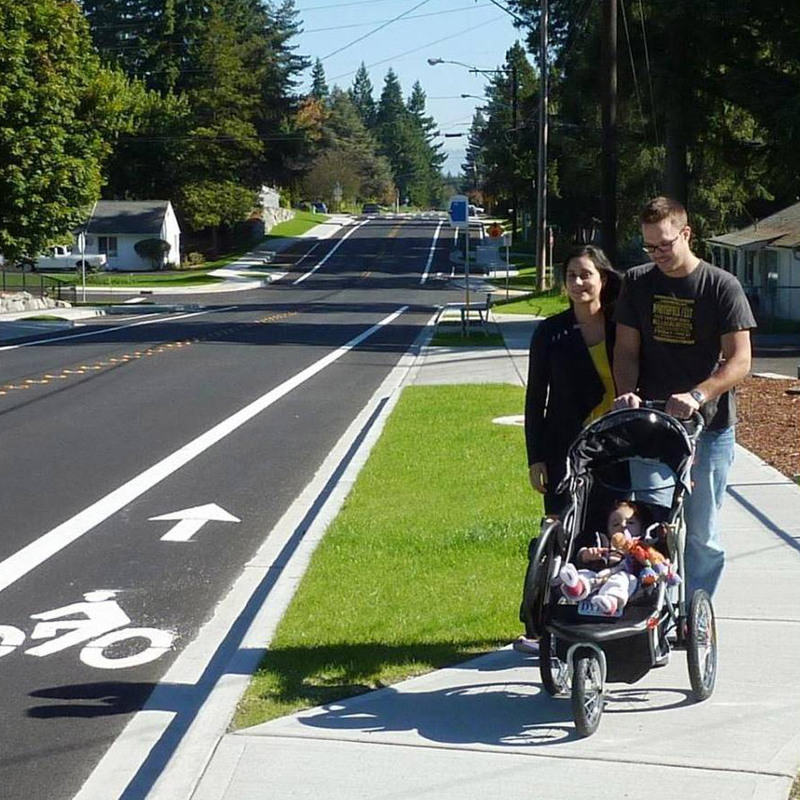 Building streets that are safe for pedestrians and bike riders improves the safety for everyone. The bonus for travelers and taxpayers as jurisdictions redesign to create streets for all is that a street that discourages speeding and makes it possible to ride a bike or cross the street is safer for everyone, including people in cars. Even if you think that particular crosswalk at the next corner doesn't matter to you personally, we're not just talking about a few people benefiting; around 30 percent of all Washingtonians either can't or don't drive for reasons of age, disability, income, preference, or other factors. It's going to take time to get these more livable streets as we move beyond outdated assumptions about transportation. For our engineers this means learning new approaches, particularly for those places where the state highway functions as the main street, a bike tourism route, or the only available connection between two segments of a growing trail network. Until just a couple of years ago, our highway design manual only allowed for bicycling on highway shoulders and conventional bike lanes, and we had never put green paint in a bike lane on state right-of-way. A lot of new solutions have emerged in the past few years: protected bike lanes, protected intersections, bike boxes, "floating" transit stops that provide a buffer for bicycling connections and the sidewalk, leading pedestrian intervals in signal timing, and more. 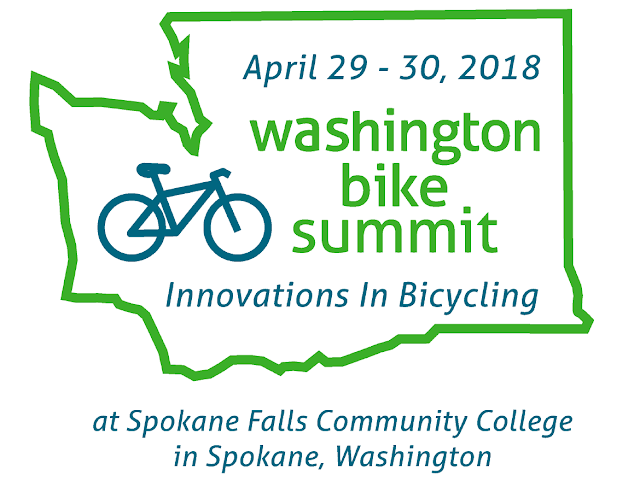 We're excited to help sponsor the upcoming Washington Bike Summit in Spokane later this month. Our partners in cities and towns are working to create low-stress networks and more walkable communities because this supports transportation and health equity, more active environments and more economic growth. Whether it's Safe Routes to School or becoming an Age-Friendly Community – they're thinking about all ages and abilities. They want us at the table with them looking for practical solutions for connectivity, safety and mobility. The Federal Highway Administration has been bringing out fantastic resources at such a pace it's hard to keep current and we'll see new bike and pedestrian guides coming out from American Association of State Highway and Transportation Officials as well. We've been providing multimodal design training in our regional offices and have a new multimodal technical group working on the next round of updates to our design manual. To help everyone get up to speed, we're sponsors of the upcoming Washington Bike Summit, April 29-30, in Spokane, making national-caliber training available in-state for our staff, our partners, and community advocates and leaders. Registration is open until April 15 — it's not too late to sign up and student scholarships are offered, so we're hoping some of our future workforce will be in attendance. With sessions on everything from measuring multimodal connectivity to collecting data to doing community-based safety assessments, it's one more step on the path in our learning and our evolution as an agency. For many, the idea of becoming a parent in and of itself is daunting. The questions and stresses – everything from what diapers and car seats to get to what doctor to choose – seems never ending. Before my first daughter was born, I spent a great deal of time weighing the pros and cons of being a stay-at-home mom or returning to work and trusting a stranger to care for our newest and most precious family member. The thought of leaving my new baby in the care of a stranger terrified me more than the thought of sleepless nights or endless diaper changes. I made the most of the 12-week maternity leave my then-employer allowed, spending my time forming a bond with my child. Left: Southwest Region Communications Manager Kimberly Pincheira and son Zander support WSU and our communications team. Right: Planning specialist Chelsey Martin and son Hendric hard at work in our Vancouver office. But sooner than I would've liked I returned to work, leaving our baby with her new daycare provider, who was great. But for many parents, it's a cruel game of "would you rather." Would you rather spend time with your new baby, at home, un-paid? Or would you rather spend the day at work because you have bills to pay and a baby to provide for? That's why our agency's year-old "Infant at Work" program is such a fantastic perk. What is the "Infant at Work" program? 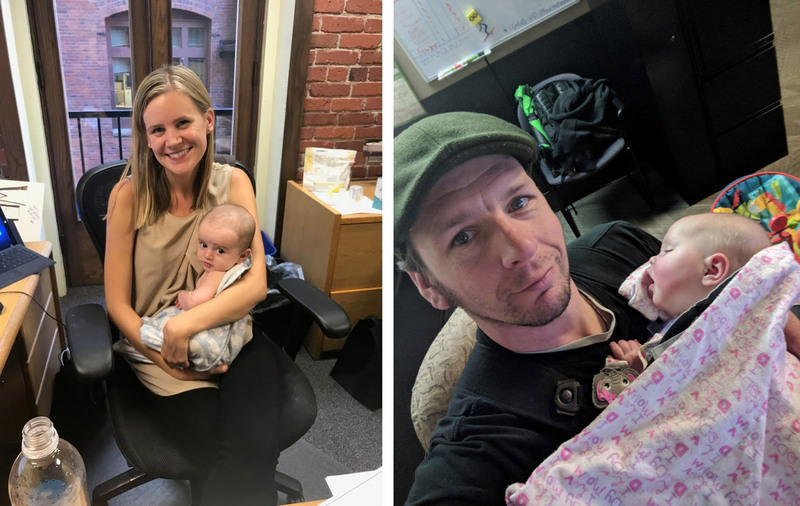 The Infant at Work program allows some employees to bring their babies to work when they're six weeks old until the infant turns six months old, or they become mobile. The baby has to be in an office-type setting. Our Incident Response Team, for example, can't bring the baby along while they patrol the highways. The type of work, location and safety has to be taken into account when determining eligibility. The program is designed to provide a modern, flexible work environment and allows employees the chance to continue working rather than taking an extended leave, or leaving their baby with family or daycare. It promotes a positive work/life balance, allowing the parent to continue bonding with their child while also allowing them to get important work done. So what's in it for WSDOT? This isn't a one-sided deal. 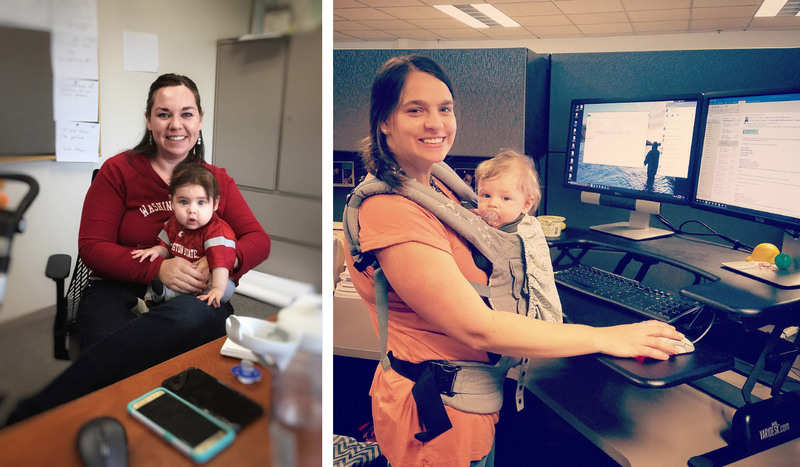 The Infant at Work program allows the employee to return to work sooner, increases employee retention and lowers turnover costs while improving employee loyalty and morale. Giving the baby consistent access to breastfeeding has also shown to have health benefits, lowering health care costs. Left: Emily Glad keeps working as our Toll Division Communications Manager while son Anders supervises. Right: Ferries worker Tim Wiess is able to get work done while daughter Grace naps. What happens if the baby cries, or if the baby is sick? Babies get sick. Babies cry. There's no getting around that. Maintaining a healthy and productive work environment was a primary consideration in developing this program. If the infant becomes sick, is disruptive for a prolonged period of time, causes a distraction in the work place, or prevents the parent from accomplishing work, the parent must take the infant home or to a backup daycare provider. While having a baby at work can be great, it can't be at the detriment of co-workers. We've reconfigured already existing areas of our offices into safe, quiet spaces for parents to take their baby for them to calm down. These offices are equipped with a computer to allow the parent to continue working without interrupting co-workers. Having worked around some parents who brought their babies to work, I can vouch for the fact that the program works. My coworkers who have brought their child to work are clearly happier, and the babies are happy. I haven't found it to be distracting and it allows the employees to be productive while feeling valued and appreciated. It's a program I wish I could've taken advantage of when my children were that age and I'm happy for my colleagues and their babies who will have this opportunity to form those important bonds while also remaining producting employees. With four weekends of ramp metering from Mercer Street to Interstate 5 in the books, we have seen the system prove itself as an effective tool to help manage freeway traffic. Our goal is to keep the area moving as safely and efficiently as possible. Initial testing also shows drivers are still adjusting to the changes and are not fully utilizing all lanes approaching the ramp meters. In order to give drivers more time to get comfortable with the new meters and for us to install additional signage, we are pushing back our original launch date of weekday ramp metering by a week to Tuesday, April 17. The Mercer Street ramp meters lit up for the first time on Saturday, March 10. We spent the past four weekends monitoring the new meters and refining the operation to best fit travel patterns. 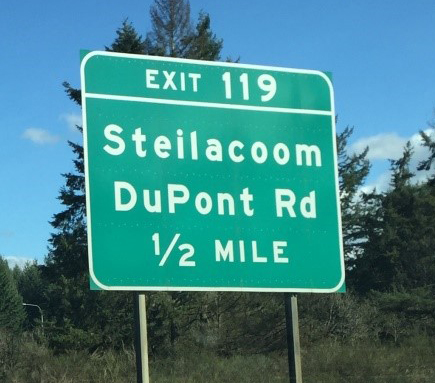 To help make the addition of ramp meters to the area more visible to drivers, we will add new temporary signs to both the north and southbound ramps to I-5 before we turn the meters on during the week. We observed on Saturdays and Sundays that drivers heading northbound onto I-5 were hesitant to use the left lane. When the meters are on, a sign flashes to advise folks to use both lanes. We expect that additional signs will grab drivers’ attention even more. Within the next few weeks we will also be installing an electronic sign on the northbound ramp to further alert drivers that they can use either lane approaching the ramp meter. Drivers hesitate to use the left lane when the northbound ramp meters are activated. When the meters activate on the southbound on-ramp, drivers can spread out into three lanes thanks to the use of the shoulder. While we saw some folks use the left shoulder, we expect drivers to take full advantage of this option as they continue to get used to the new meters. Drivers are encouraged to use the left shoulder lane when the southbound ramp meters are activated southbound. When and why did the ramp meters turn on? Remember, the ramp meters don’t just turn on at a specific time each day. Instead, they turn on when the system detects traffic slowing down on I-5. When it comes to a typical weekend, we likely won’t see the ramp meters turning on as much as they will when more vehicles are on the road during the week. This has proven out so far on weekends, where the meters have automatically activated at different times of day depending on how I-5 was operating and how much Mercer Street traffic was entering I-5. Ramp meters really show their effectiveness when it comes to managing traffic following a crash. We saw three crashes over the first weekend where the ramp meters did their job. They allowed for one vehicle at a time to merge onto the interstate where traffic was backing up due to a crash ahead. What about Mercer Street traffic? 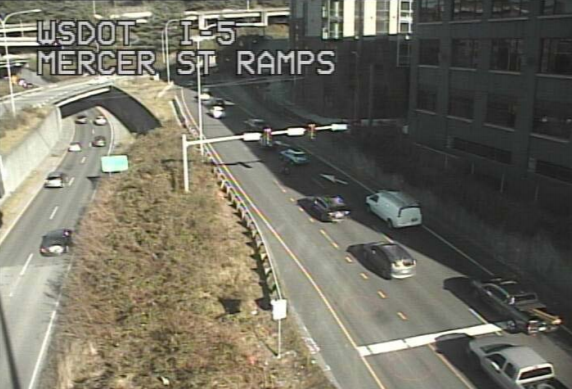 We know many of you had concerns that the ramp meters would make traffic worse on Mercer Street. We worked closely with our friends at the Seattle DOT to monitor city street traffic and saw no impacts from the new meters. It’s important to understand that the meters are allowing the same number of vehicles onto the freeway as before; they just break up the pile of cars trying to merge and organize them in a manner that has less impact to the flow of traffic on I-5. The largest benefit of the Mercer Street ramp meters will be at the beginning and end of the peak commute times. The meters prevent big groups of cars from piling onto the freeway at once, which will keep I-5 flowing smoother during those times. When congestion reaches the peak, severely slowing freeway traffic, ramp meters are not as effective. However, we keep the ramp meters on in order for them to quickly adapt to changing traffic conditions and help the freeway recover quicker by pacing the merging vehicles onto the freeway. Sixty-four ounces of Slushee and someone's terrible decision nearly cost Trent Galusha his life on the side of I-5 six years ago. Galusha is one of our Incident Response Team drivers, workers who spend their days driving the highways helping stranded motorists and protecting first responders at crash sites. During the 2012 Memorial Day weekend he was helping someone who had run out of gas – a standard part of his day. Then suddenly, a young man driving by – impaired and with a suspended license – thought it would be funny to chuck the frozen beverage at Galusha on the side of the road. The drink came flying out of a car going at least 60 mph, striking Galusha in the head with 300 pounds of force. Doctors told IRT driver Trent Galusha he was lucky to be alive after a passing motorist threw a frozen beverage at him on the side of the road, striking him in the head. Galusha doesn't remember the impact – all he knows is that he was walking back to his truck and the next thing he knew he saw white lights. He'd later learn that he had traumatic brain injury. He spent seven months off work, retraining his brain how to process again and struggling with pain and unpredictable rage. It took two years before he fully felt like himself again. IRT driver Ken Buretta still has post-concussion headaches and sensitivity to light, noise and cold after being injured on the side of the road while helping a stranded motorist on Thanksgiving Day 2016. "My family didn't sign up for that," he recalled last month. "It shook my world. It shook my family's world. I wouldn't wish this on anyone." Doctors told Galusha he was lucky to be alive. If the cup had hit him in the temple – just two inches away from where it did strike him – he could have died instantly. Unfortunately, Galusha is not alone. And that's why we'll be spending the next month sharing work zone safety messages with the public. We're turning both our website and Seattle's SR 520 bridge sentinels orange this week. On Monday, April 9, for National Work Zone Awareness Week, we'll fill a lawn near the Capital in Olympia with 60 orange work zone barrels – one for every WSDOT worker killed on the job since 1950. We'll also share safety messages and employee stories. Far too many of our workers have been hurt by drivers not paying attention or losing control of their vehicle. Other times, workers trying to keep everyone safe are sworn at or have things thrown at them by people upset by roadwork delays. (In Galusha's case the driver was caught and sent to prison). Seconds count in work zones, because the work often takes place very close to active traffic. "If you've ever been stranded on the side of the road you remember how your car shook every time another vehicle zoomed past at 60 or 70 mph," said IRT driver Ken Buretta, who suffered a concussion after being sideswiped as he was getting out of his truck to help someone on Thanksgiving Day 2016. "Imagine what it's like to work in that." "We're not feet away from death, you're honestly less than 10 inches away," Galusha said. "And most people are great – I love being out there and helping people – but it's that three percent who don't slow down or aren't paying attention. … I bet you I see 30 plus people a day still texting and driving or watching videos while driving." 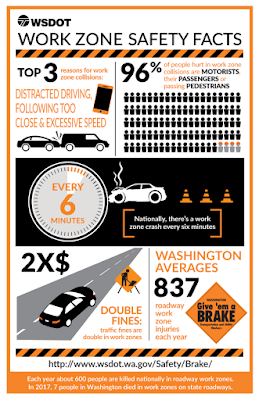 Nationally, there's a collision in a work zone every six minutes. Here in Washington we average 837 roadway work zone injuries each year – and had seven fatal work zone crashes in 2017. And it's not just workers at risk. 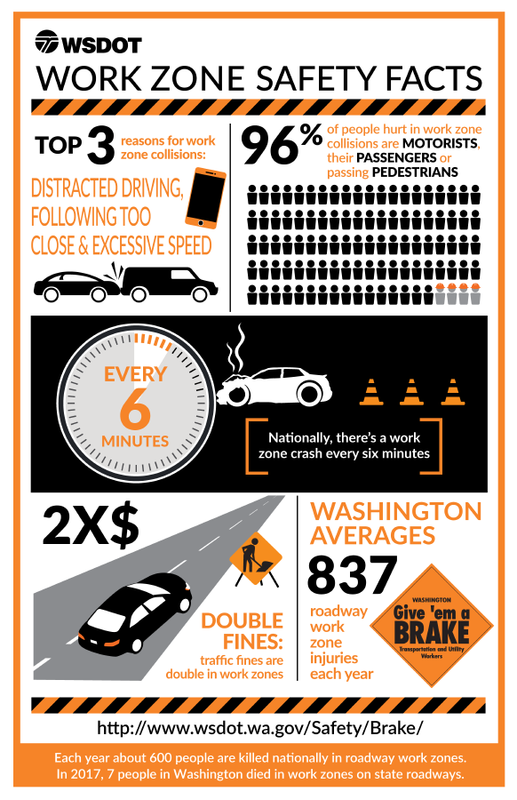 In Washington, 96 percent of people hurt in state work zone crashes are drivers, their passengers or passing pedestrians. The next time you're driving past a work zone, please remember the workers like Galusha and Beretta who are out there to keep drivers safe or improve roadways. "Whenever you see any lights – red, yellow, blue or whatever – just move over and give us some space," Buretta said. "We all need to go home to our families."